Product #55502 | SKU ASDX256GUI3V30S-R | 0.0 (no ratings yet) Thanks for your rating! 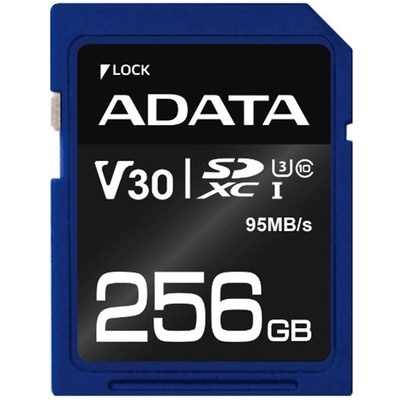 The ADATA 256GB Premier Pro V30 SDXC UHS-I U3 Memory Card (Class 10) delivers enhanced performance with read/write speeds up to 95/60MB/s, allowing the capture of high definition images and videos, including burst mode photography. They are V30 (Video Speed Class) qualified and support Ultra HD 4K video recording. Backed by solid multi-point protection, Premier Pro SDXC UHS-I U3 memory cards are the durable and reliable choice of professional photographers and enthusiasts for capturing every fantastic moment with utmost precision. Premier Pro SDXC UHS-I U3 memory cards are equipped with a built-in write-protect switch and automatic error correcting code (ECC) functionality. They pass rigorous waterproof, shockproof, X-ray proof, anti-static, and extreme temperature testing for rugged durability. All cards feature high-quality MLC Flash, ensuring longevity and reliability. Premier Pro SDXC UHS-I U3 memory cards are suitable for high-end D-SLR, D-SLM, and 4K digital cameras, empowering professional photographers and enthusiasts to best capture the most vivid and memorable images. Premier Pro SDXC UHS-I U3 specifications support high definition Full HD and 4K Ultra HD video recording, allowing every remarkable moment to be sleekly captured without lag or degradation of performance. The read/write rate of Premier Pro SDXC UHS-I U3 cards is up to 100/60MB per second, which shortens the time to edit and upload files and supports burst modes thanks to outstanding performance. The cards meet V30 (Video Speed Class) specs, meaning they can record up to 30MB of video per second. This is more than enough for Ultra HD 4K video recording, all of which are especially suitable for professional photographers. Premier Pro SDXC UHS-I U3 cards allow users to store thousands of photos and hours of Full HD video. Whether working on a burst photography shoot or recording uninterrupted video, the Premier Pro series of memory cards enable you to concentrate on the task at hand without worrying about getting interrupted by running out of storage. * Read / Write speed based on ADATA internal testing; performance may be lower depending on host device.